New Pampers Swaddlers diapers with DRY MAX are Our Driest Ever with the Absorb Away Liner. 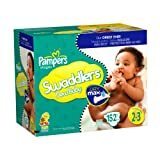 Pampers Swaddlers Dry Max Diapers helps lock in wetness. The Absorb-Away Liner helps keep babies dry and happy. Quilted blanket-like softness wraps babies in all-around comfort. Super-stretchy sides gives infants a flexible fit.